The Cougars had the passion and desire to battle for their first victory of the season, so the taste of defeat was swallowed in the bite taken out of the Hive during the 40th Hardy Bowl as East Hardy crushed the homecoming swagger in Moorefield by a score of 20-7 last Friday. East Hardy (1-6) kept the momentum going from the start to win the Hardy Bowl for the seventh time in the past eight seasons, however the Yellow Jackets (2-6) have a 26-14 advantage in the overall series with two more wins added for playoff meetings. There was no empty seat at Yellow Jacket Field as fans lined the fences for the 40th Hardy Bowl and the cheers roared throughout the game, but that wasn’t the only noise factor as cattle at the nearby stockyards bellowed out all night long. “It’s exciting. I’m more so excited for the boys than anything, because they are reaping the benefits of a good week of practice. 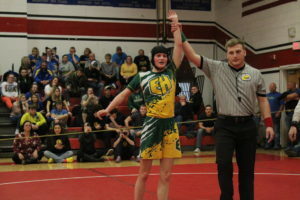 They are taking care of business and hopefully they will build on that momentum going forward,” East Hardy Coach Devon Orndorff remarked. Moorefield punted on the first two possessions, while the Cougars gained the upper-hand scoring touchdowns twice on their drives. An onside kick to commence the Hardy Bowl was unexpected as Jeffrey Mills snatched the ball for the Cougars, but there was an offsides penalty assessed as Moorefield started in East Hardy territory at the 42-yard line. Moorefield’s Javen Fawley caught a pass from quarterback Brent Moran for three yards and was tackled by East Hardy’s Austin Alt. Matthew Jenkins took a direct snap for the Yellow Jackets and took off around the right side for a six yard gain before being tackled by Chance Dove. Fawley converted the third down at the 28-yard line as East Hardy’s Alex Miller and Andrew Tharp garnered the stop. There was a fumble on the next play, but Moran picked the ball up and was chased out of bounds on a six yard advance before having the sequence negated on a holding call moving the line of scrimmage back to the 44-yard line. Jenkins fumbled the ball on the next handoff and the Yellow Jackets managed to recover losing three yards. Moorefield’s Benjamin Pyles caught a pass and in the process of going to the ground the hit by Alt jarred the ball loose, but the ruling was being down prior to the fumble. The Yellow Jackets faced 3rd-and-18 forth 36-yard line and the next pass attempt fell incomplete as Aden Funkhouser defended on the play forcing a punt which was sent into the end zone by Atikilt Tamiru. Alt was denied any yardage on the first play by Moorefield’s Vincent Cyrus and Matthew Weatherholt. Moorefield’s Coleman Mongold had tight coverage forcing an incomplete pass. East Hardy snapped out of the stigma as quarterback Aden Funkhouser found Christian Dove for a 35-yard third down conversion for a first down at the Moorefield 45-yard line where Blake Funk recorded the stop. Jenkins and Weatherholt stopped Alt for no gain on the following play. East Hardy’s Chance Dove caught a pass and slipped as Pyles stepped in to make the tag on the 16-yard sequence for a first down at the 29-yard line. A hit by Moorefield’s Ethan Sines appeared to cause a fumble, but Alt was down and smothered it. Funkhouser hurdled a defender and was tackled by Noah Ketterman and Riley Hedrick with the Yellow Jackets sidelines shouting for a penalty regarding the hurdle, but instead a flag was thrown on a Moorefield infraction placing the Cougars in the red zone at the 14-yard line. Chance Dove was dropped for a one yard loss by Funk and Seth Wilson. Alt picked up three yards and was brought down by Weatherholt, then Christian Dove caught a pass diving to the nine yard line with an ankle tackle by Funk. Facing 4th down, the Cougars used a hard count and Moorefield was called for an offsides penalty shifting on the line which created a first down. Chance Dove drove the ball up the middle and was denied a touchdown at the goal line by Wilson. On the ensuing play, Funkhouser punched the ball in for the one-yard touchdown with 2:10 left in the first quarter and the extra point was nullified on a penalty with the second attempt going awry for a 6-nil lead. Moorefield’s Jackson Weese made a 22-yard return on the kickoff, but a holding penalty put the ball at the 21-yard line. Fawley bounced outside and was tripped up by Tharp during a first down gain of 13 yards for the Yellow Jackets. 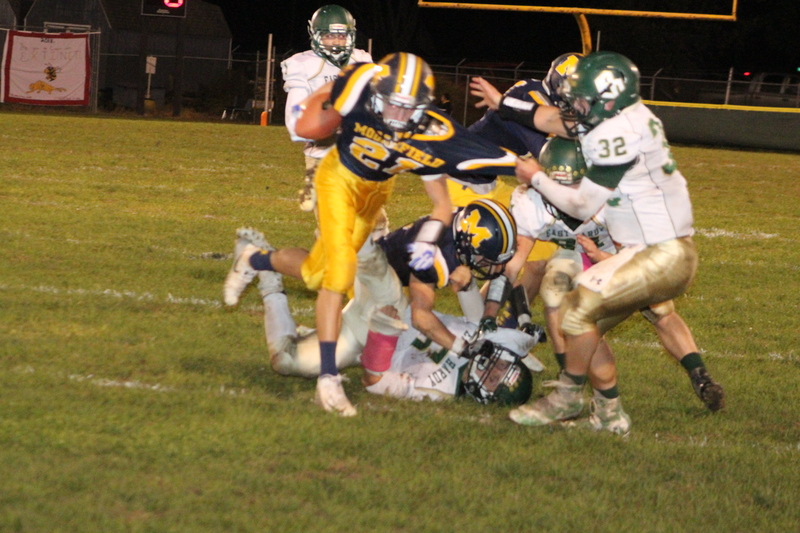 Fawley added five yards and was brought down by East Hardy’s Logan Whetzel and Aaron Fishel. Moran was tackled by Ryan Rogers with a personal foul face mask moving the chains at the Cougars 49-yard line. Pyles made a diving catch with Mills coming in for the tackle on another first down at the 38-yard line and an incomplete pass ended the first quarter. East Hardy’s Adam Larson’s coverage forced a deep throw going overhead. Rogers sacked Moran and a holding penalty was added as the Yellow Jackets punted from the 45-yard line. Funkhouser was met at the sidelines on a two-yard pickup by Moorefield’s Jenkins and Matthew Wright at the 21-yard line. After a play for no gain, the third down pass from Funkhouser to Christian Dove was grabbed along the sidelines for a first down at the 38-yard line. Mills was kneeling on a catch for a seven yard gain as the Cougars kept the momentum going. Funkhouser dodged tackles collecting a first down at the Moorefield 35-yard line on a 20-yard carry before being chased down by Sines. After a low pass was not hauled in by Dove, Alt added eight yards on the ground with a tackle by Mongold. Moorefield was flagged for being offsides which created a first down for the Cougars at the 22-yard line. A pass went too high, then Chance Dove carried the ball six yards, then the Yellow Jackets were called offsides again for another East Hardy first down at the 11-yard line. Cyrus and Funk tackled Alt on a four yard gain, then Funkhouser was stopped for one yard loss by Weatherholt despite an extra effort to reach forward. 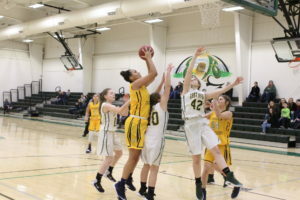 Mills made the eight yard touchdown reception at the 5:27 mark of the second quarter, then during a block on the extra point a personal foul was called allowing another attempt with East Hardy electing to go for a two-point conversion with Christian Dove catching it for a 14-0 advantage. “I was excited about it coming into the game and I wish the score would have reflected the excitement coming in to it and that’s just how it is. They were excited for the game. They had a good week of practice and prepared well. The intensity was good. 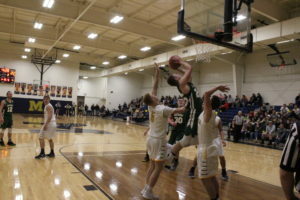 I can’t fault them of their effort, their effort was great,” Moorefield Coach Matthew Altobello commented.